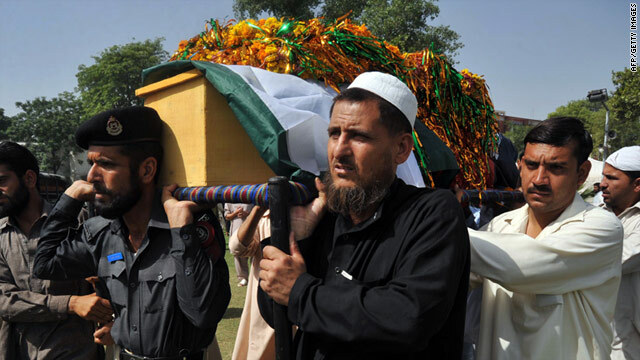 Relatives and officers carry the coffin of a Pakistani policeman killed during a militant attack in Peshawar on Wednesday. More than 60 militants attacked a security checkpoint Wednesday, killing two security personnel and wounding five others in northwest Pakistan, police said. Ten militants were killed in the gun battle that occurred in a village near Peshawar, a senior police official said. This attack comes a day after a contentious clash between NATO troops and Pakistani forces in the same area. On Tuesday, two Pakistani soldiers were injured during clashes with NATO forces. NATO helicopters flying in eastern Afghanistan fired across the border into Pakistan after being fired on twice, a NATO official said. Two coalition helicopters supporting operations at U.S. Forward Operating Base Tillman in Afghanistan were fired upon from the Pakistani side of the border, said the NATO official, who did not want to be identified because the information has not yet been released publicly. After being fired upon a second time, the helicopters returned fire, the official said. Tillman is a few kilometers from the Pakistan border. The Pakistani military said it has lodged a "strong protest" and called for a meeting of the two sides. Pakistani intelligence officials said the incident started when a NATO fighter jet entered Pakistani airspace near the border with Afghanistan. Pakistani troops began firing at the jet from the ground, said the officials who did not want to be named because they are not authorized to speak to the media. The jet retreated and then returned, accompanied by helicopters, and fired on a military checkpoint in a village in North Waziristan, the officials said. Osama's conflict with Taliban. Taliban has done violent attacks on video shops. Per Jan 2011 http://www.thehoot.org/web/home/story.php?storyid=2894&pg=1&mod=1&sectionId=38 ..."in the last three years Pakistan saw a growing incidence of attacks on cinema, cable, audio and video, symptom of the growing influence of the Islamic fundamentalism of the Taliban"... Per http://www.liveleak.com/view?i=62f_1224085711 ... "The CDs, mostly naughty, were being set ablaze..." "We had received letters from ...presumably Taliban ...who warned us to immediately close down this business," Osama preached Islamic virtue, but shockingly was addicted to naughty videos and possessed a large stash of them..It will be interesting to see the reaction of his followers to the discovery of these videos in Osama's compound.